Actually using the text files (http://dmccooey.com/polyhedra/DualGeodesicIcosahed...) would help build the geometry with a code that would read the file and build all vertices, edges, faces... no need for math logic. Rugge, how did you format the text file? thx Rugge, one more Q: my preview shows nice flat surfaces, however once pressing ok, my meshed surface gets rounded off... there arn't that many options to fiddle with sooo... whatamidoingwrong? found it! tools options-DSE, Display Modes, Mesh "Flat"
Because it was a very interesting theme, I creating a macro. 1. Please put "Visual_Polyhedra_Import.bas" and "SurfaceFactory.cls" in the same project. The entry point is "CATMain ()" of "Visual_Polyhedra_Import.bas". 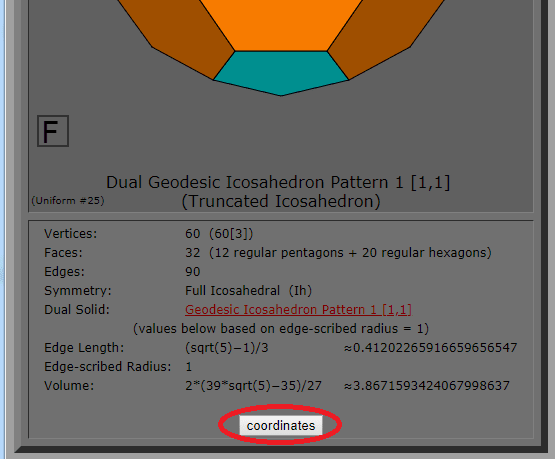 2.For each data of WEB site "Visual Polyhedra"
Please save coordinates as a text file and load it with macro. 3.After starting the macro, please select coordinate text data. There are surfaces that fail to be created. so it is impossible to create a fill surface. In order to shorten processing time, creation of instances is minimized. vbNewLine & "time : " & SW_GetTime#() & "s"
Dim Msg As String: Msg = "Please select the file to import"
Dim SelectionType As String: SelectionType = "*.txt"
MsgBox "Could not create a surface." Excellent work, thank you for this example. 1. Click "coordinates" to open the link. 2. Right click and save as a name. thank you. I still get the message "could not create a surface"... any idea why? 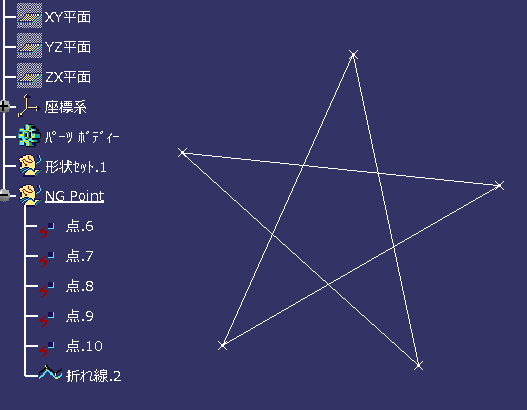 Some of the data I tried represented one that expressed the star surface with 5 vertices. Those whose boundaries of one surface self-intersect can not be imported because fill surface can not be created. Please try with this text file. I can not understand the cause. It is the environment tested here. Please execute the attached macro. Since "dump.txt" is completed, please attach the file. It seems that coordinate values can be acquired. There is a possibility that the license for perhaps operation of the surface is insufficient. Catia V5R26.4.38 I have access to quite a lot of Workbenches... some are shareable though. Which ones should I have? I think that it is possible if GSD is probably available. The command you are using is 'Point' 'Polyline' 'Fill Surface'.